Lionel Andrés Messi (born June 24, 1987 in Rosario) is an Argentine football (soccer) player. Lionel Messi started playing football at a very early age in his hometown’s Newell’s Old Boys. From the age of 11, he suffered from a hormone deficiency and as Lionel’s parents were unable to pay for the treatment in Argentina, they decided to move to Barcelona, Spain. In the 2003-2004 season, when he was still only 16, Messi made his first team debut in a friendly with Porto that marked the opening of the new Dragao stadium. The following championship-winning season, Messi made his first appearance in an official match on October 16, 2004, in Barcelona’s derby win against Espanyol at the Olympic Stadium (0-1). With several first team players seriously injured, the services of several reserve team players were called upon, and Messi became a regular feature of Barça squads. On May 1, 2005, he became the youngest player ever to score a league goal for FC Barcelona against Albacete when Messi was only 17 years, 10 months and 7 days old. He was offered the chance to play for the Spain national football team, but declined, prefering to wait for the opportunity to play for the country of his birth. In June 2004 he got his chance, playing in a U-20 friendly match against Paraguay. In June 2005 he starred for the Argentina U-20 team that won the Football World Youth Championship played in The Netherlands. Messi picked up the Golden Boot as top scorer with 6 goals, and the Golden Ball for the best player of the tournament. Despite his youth, Lionel has already drawn comparisons with Diego Maradona, arguably the best football player of all time. On September 25, 2005 Messi obtained a Spanish citizenship and was finally able to make his debut in this season’s Spanish First Division. He had previously been unable to play because FC Barcelona had filled up all of their quota of non-EU players. Messi’s first outing in the UEFA Champions League at the Nou Camp was on Sept 28 against Italian club Udinese. He impressed with some great passing and a seemingly telepathic relationship with Ronaldinho that earned him a standing ovation from the 70,000-odd Nou Camp faithful. On December of that year, the Italian newspaper Tuttosport awarded him the Golden Boy 2005 title for the best under-21 player in Europe, over Wayne Rooney and Lukas Podolski. 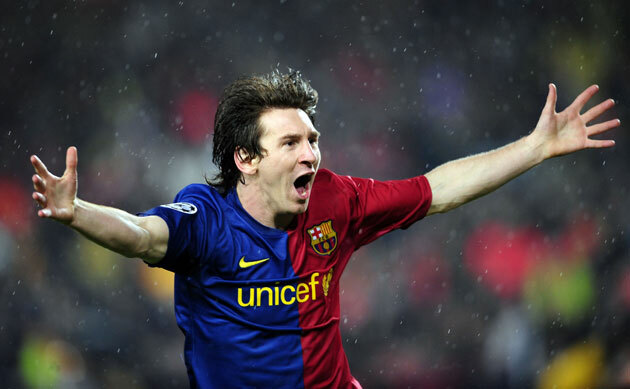 In September 2005, Messi was given an improved and extended contract until 2014. Checkout the ASCII Art of Lionel Messi in the below link. Please use Lucida Console font to view the art in Notepad. Before that in Notepad go to Format and Uncheck the Word Warp and then Go to Font and Reduce the Font Size to 3 to 4 pt. Use only Lucida Console Font.